On your wedding day, you might want some posed images, but you mainly want the authentic moments and emotions that are happening to be captured by an artist. That is what Iwen Exposures Photography offers. This photography company captures images that are true to the personalities and styles of the people in the photos. In addition to taking still photos, this company offers complete videography services so you can be sure that your big day will be captured from every angle and with every possible film. The natural talent of the photographer at Royce Studio Photography is evident from the very first images you see. This company shoots a wide variety of events and portraits for affordable rates. This is because the company is focused not on capturing a specific event, but on capturing lives, allowing them to branch out beyond weddings. For wedding photographers in Omaha, NE however, this company provides top photography services and affordable prices that include 9 full hours of complete coverage. Tom Sterba Photography has had the honor of being named ‘Nebraska’s Wedding Photographer of the Year’ five times. You can’t argue with talent that has been so widely recognized. This photographer believes in giving the clients what they want, not taking control of their special moments, unless that is what they want. Clients love working with this man because he makes the experience fun and lighthearted while producing beautiful and professional images in the end. His personality and experience clearly create a winning combination. The two photographers at Lane Weddings specialize in capturing weddings with a unique approach. Each of these talented artists work to shoot your big day as it happens. Rather than spending many tedious hours posing for pictures, they keep the posing to a minimum and focus on capturing the real moments between you, your partner and your guests. The packages this team offers are always simple, comprehensive and the prices are designed to be affordable. Any couple can be well served by Lane Weddings. JM Studios is a fun and professional partnership between Janie and MaKenzie. These two ladies bring the laughs and the talent when they are hired to shoot any wedding. These two experts mean that when you hire this team, you will have every angle covered by one of their lenses. Reviews from former clients list nothing but good things about these ladies and the photos that result from their wedding days. These ladies are famous for joining in the fun of your day to get the best images possible. From the very first shot taken by Geoff, the photographer at Geoff Johnson Photography, you can see that he has a keen eye for capturing beautiful and romantic images. 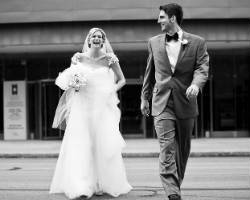 This Omaha wedding photographer is one with his camera whenever he shoots. His style is a mix of editorial and classic. Since this photographer is so talented and in such high demand, his services do not come cheap, starting at $5,200. This rate reflects his high profile in the wedding industry and his natural talent for the art.